I’m about to give away the farm. And it’s not some chump farm with a few dying rutabagas. This is a big deal, a modern farm with brand new tractors and a gaggle of gold-laying geese. This isn’t the first time I’ve brought this idea up, either. If I was an able-bodied soul with oodles of money at my fingertips and an engineering staff waiting at the ready, I wouldn’t write articles about it, I’d do it. Unfortunately, neither fate nor hard work nor a well-meaning father with not enough time on his hands and a penchant for buying his child’s love has made that happen. So, I turn to your friend and mine, Steve Jobs, and plead for the following. You may have heard this before, but this time, I made a groovy picture to go with the idea, and I just had to write about it. I want a real multimedia hub. Not a wanna-be media hub, but a real one. Sony’s trying, with its integration of some AV features into its Vaio line, and maybe some would think it is succeeding. But that’s not good enough for me. Apple is also trying to make a digital hub. Its ideas of iTunes, iPhoto, iMovie, iDVD, etc. certainly go a long way towards achieving that goal. However, the shortcomings are so glaring it’s no wonder that not only does Apple have less than 10 percent market share, but, like many companies before it, Apple doesn’t seem to quite get it when it comes to how people use AV equipment. The ability to listen to real, not just Internet, radio. Say, AM/FM/XM (maybe even ham radio frequencies, but I don’t think that’s truly vital). The ability to watch TV. And I don’t mean that cheesy PC kind of TV watching, you know what I mean, where the whole computer crashes after you change the channel the 100th time. I mean like a real TV, where you turn it on, it goes full-screen, end of story. If you want TV in a window, that’s fine, but I don’t really think that’s the priority. PVR – Personal Video Recorder. I’m inclined to recommend working with the TiVo people and creating an interface that works with the Mac hardware. You could even have a separate hard drive and methods to keep people from easily digitizing programs, if that’s a big issue. Video output. You should be able to drive a standard TV screen if you so choose with any of the AV aspects of the system. Wireless surround speakers. Not necessarily this design, but how about a good set of speakers that use some groovy wireless tech to connect? They should include a real subwoofer, with maybe a speaker for the center channel in the main system. Remote control. This is a big part – the whole shebang should use a remote control that can access everything, including the CD in the iMac, or DVD, or whatever, plus iTunes, any iMovies you might have, etc. This remote should be able to turn the whole system on, and choose the mode that the system boots to. That last bit is important. The system should be able to automatically boot to a setup that only accesses those items that Apple makes. That way, it can work just like a reliable AV component, instead of a flaky computer (Mac OS X is good, but it is sometimes very flaky). Why, you may ask, do I want all of this? Because I see the power of the Mac, and I know it could emulate every one of these bits of equipment. But it doesn’t. And it should. 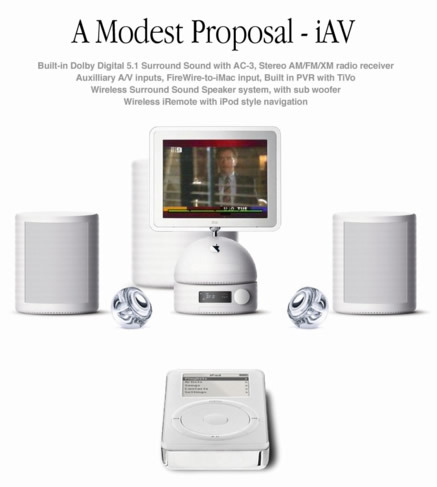 For all those folks in apartments and dorm rooms and rooms above the garage and little cabins in the woods with cable TV and power, I think an all-in-one system like I’m describing would sell, sell, sell. So there it is, my farm. I hope you enjoyed the tour – I am really just giving it away. Pay no attention to the glow behind the goose barn, that’s just Yucca Mountain ... I mean, that’s just an iMac working into the night.